The strong lover, the fodder of many a dime store novel. Yet too often the hero or heroine is just the opposite of Kempis’ hero, plunging instead into temptation and believing the persuasion that the fulfillment of lust justifies any behavior. Jesus is our great example of love. He is the archetype of hupomone. Christ stood fast. He stayed the course to complete a plan that called for the complete sacrifice and abasement of his very being. He rejected the lies of the enemy time after time. He rejected that Matthew could never be anything except a crooked tax collector. He rejected that a girl named Mary Magdalene was too soiled to be of any use to anyone. He rejected that a woman of Samaria could never serve the Gospel. He rejected that the human race was not worth the sacrifice. He rejected that a young man who was raised in the faith but walked away wreaking destruction all around him for 25 years could not turn his life around and become a tool of the Holy Spirit and a man who sees value in imitating Christ. As the song says “This is love”. It stands fast in Truth. The strong lover is based not in circumstance but based in the Gospel, a love that is truly for richer or poorer, in sickness and in health but its strength transcends the grave. This is the love God has for us and it is the love that is required of any who would be proved a true lover. Do not let kindness and truth leave you; Bind them around your neck, Write them on the tablet of your heart. I recently read this verse during my morning devotions. It was only about 5 minutes later that I snapped at one of my daughters for something silly (probably for interrupting my morning devotions….). The importance of Binding kindness and truth around your neck became readily apparent. Have you ever bound something around your neck? How about something heavy. Kindness and truth are not lightweights. They have an heavy impact on everything we do. How about writing them on the tablet of your heart? The picture here is not the easy process that I am using now (typing quietly into my laptop, with the delete button just a fingers width away). It is not even pen or pencil on paper. The picture here is a clay or stone tablet (sorry not an Ipad or Android) inscribed by a stylus or sharp instrument. Once written it could only be removed with considerable effort. The deeper the inscription, the more permanent the message. The picture is not complete without consideration of the physical impacts. I do not think that the writer wanted to shortchange the difficulty or even outright pain of righteous living. It is neither comfortable nor enjoyable for things to be cut into our hearts. Consider our modern culture. TV shows, movies, books; they all extol the virtues of the free heart. Our clothing is loose and light, even high quality body armor is extolled for its lightness and the fact that it does not inhibit the movements of the wearer. We do not want to be restricted. Here is a truth from this passage: Kindness and truth are restrictive. They set limits on our behavior both internally and externally. Our human nature chafes at these limitations. We want to redefine them in a way that maintains our perceived freedoms. Kindness becomes a touchy feely thing we do from time to time when the circumstances are right. Truth becomes a function of what is working well for us for the moment crossed with what is currently most inoffensive to all of those around us. They cease to be bound around our necks nor etched forever on the tablets of our hearts. Instead we wear kindness like a fancy necklace and truth is penciled in, with an eraser close by. Do not let kindness and truth leave you; Bind them around your neck, Write them on the tablet of your heart…. not as easy as it sounds. I was driving down a local road on my way home recently when I passed a car that had been pulled over by the Toledo Police Department. Just as I passed them the officer opened the back door of his cruiser and led out a police dog. My view then turned to the young lady in the driver’s seat. I caught her just as she became aware of the impending visit of the police dog. Her face was a melange of fear, guilt, regret and despair. In that moment it captured a whole series of decisions that led her to this moment. I couldn’t help think that she personified in that moment the plight of humanity before a righteous God. She was Adam and Eve hiding in the garden from the voice of God (Genesis 3:8); the mass of humanity pounding on the door of the Ark (Genesis 7:21); David standing before Nathan the prophet (2 Samuel 12:1); Ananias and Sapphira standing before Peter (Acts 5). Granted the implications of her plight do not approach the consequences in each of these biblical examples, yet I can only imagine that her heart was very much in the same place. I cannot speak to her knowledge of God or to the potential relationships that have spoken truth to her. I will probably never know the final consequences of this moment in her life. Imagine with me for a moment that even as that police dog sniffs out her sin, the young woman throws her arms around his neck and confessing her own blindness lets him lead her out of despair into the light of adoption, a light brighter and more full of hope than the lights of a thousand police cars. 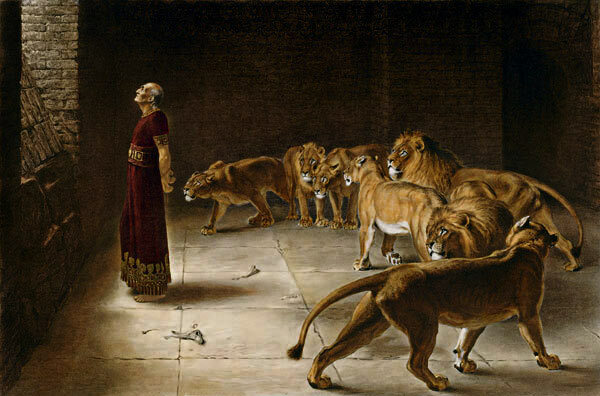 Daniel is one of the most amazing characters in the Bible for a number of reasons. Our canon of Scripture places Daniel among the prophets but the Jewish Scriptures do not. The Jewish Canon places it in a group called The Writings. While one cannot deny Daniel’s prophetic gift, he did not hold the office of prophet. Certainly God calls on him repeatedly to speak to the various leaders of Babylon, but that leads us to another unique thing about Daniel. Other than the fact that Daniel was a Jew and was taken at a young age from his home in Judah the contents do not speak of or to the Jews. So what do we know about this enigmatic figure and author of one of the 39 books of our old testament (one of the 24 in the Jewish Canon)? Daniel lived in the sixth century BC. His family was either of the royal family or the nobility. Pretty much everything that we know directly of Daniel comes from the book bearing his name. The authorship of the book is much debated but I do not doubt that Daniel wrote it near the end of his life, probably after he had retired from public service. I find most other textual criticism to be contrived either for academic reasons (you have to write your dissertation on something) or with the express need to explain away the miraculous. He grew up during hard times in Judah. His dedication to God from the very beginning would indicate to me that his parents were godly people living in ungodly times. They are not mentioned here or elsewhere in Scripture. If they did survive the siege and capture of Jerusalem Daniel was taken from them at around the age of 13. This was the typical age at which the Babylonians of this era began training for public servants. We are able to historically place the siege and capture of Jerusalem right around the year 605 BC. This enables us to date many aspects of Daniel’s life, particularly when his service to Babylon began and ended. This is what caught my attention and brought me to look a little deeper at the life of this man of God, this man of hupomone (perseverance). Daniel as we said was not a prophet, he was not a priest nor a missionary. He was a public administrator and in many ways a politician by trade. Daniel served God in the Babylonian courts and government until the year or year after Cyrus captured Babylon seizing control of that empire. That event is historically established as occurring in 540 BC. So Daniel served God in his capacity as an administrator for several versions of the Neo-Babylonian Empire from 605 BC until 540 BC, or including training around 65 years! That is some serious Hupomone! Throughout that time he maintained his dedication to and love for God, even facing death! He probably spent the last few years of his life (from 540,41 to 543,44) penning the book under the inspiration of the Holy Spirit which would become of part of the canon of Scripture we hold as the Word of God today! He was very much an Old Testament Missionary, called to a pagan people to speak the heart of God. Consider his words to Nebuchadnezzar: ‘Therefore, O king, may my advice be pleasing to you: break away now from your sins by doing righteousness and from your iniquities by showing mercy to the poor, in case there may be a prolonging of your prosperity.’ Daniel 4:27 It seems that most often studies of Daniel focus in on either the eschatological aspects of his prophecies or just a few specific events within the book. The next few weeks will be dedicated to looking at Daniel and the Long Haul.